NASA commemorates the 50th anniversary of the first American spaceflight, the Freedom 7 launch of Alan Shepard. This story was updated at 2:02 p.m. ET. 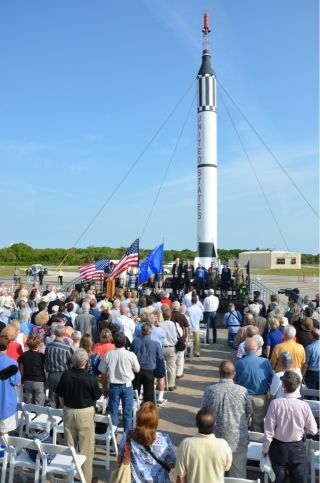 CAPE CANAVERAL, Fla. -- NASA celebrated the 50th anniversary of the first U.S. manned spaceflight today (May 5) with a time-synchronized multimedia replay of the historic event held at the same launch pad here that was used by the late Alan B. Shepard Jr. on May 5, 1961. "It was an intense countdown. Everybody had their job. There was no joking around," said Mercury chief test conductor Bob Moser before the liftoff was replayed. "But we enjoyed it, and it worked. Congratulations to all of us. We were a great team." The ceremony, which brought more than 100 workers from the original Mercury Project to Cape Canaveral Air Force Station's historic Launch Complex-5 (LC-5), also included veteran space journalist Jay Barbree, Mercury astronaut Scott Carpenter and Shepard’s three daughters. "I remember every time he spoke, he always gave credit to everyone in NASA who built the good ships that brought him home to us safely," said Shepard’s daughter Laura Churchley, who spoke alongside her sisters Alice Wackermann and Julie Jenkins. "We thank you all very much." Kennedy Space Center Director Robert Cabana and NASA Administrator Charles Bolden also attended the event, speaking about the journey of Shepard's Freedom 7 spacecraft and the astronaut's impact on the history of spaceflight. "It's an honor to share this day with so many people who helped NASA pioneer human spaceflight and enable the agency's many accomplishments throughout our existence," said Bolden. "I salute all of you." Fifty years ago today, as the world watched live on television, Shepard blasted off atop the 80-foot Redstone rocket from Cape Canaveral's Pad 5. The suborbital flight reached a maximum speed of roughly eight times the speed of sound, and topped out at an altitude of 116 miles above the Earth. The flight reached space, but did not make a full orbit around the Earth. With parachutes deploying, the one-man capsule safely splashed down in the Atlantic Ocean some 300 miles from the launch site. The New York Times declared that Shepard's 15-minute flight "roused the country to one of its highest peaks of exultation since the end of World War II." Emboldened by this achievement, President John F. Kennedy declared in a historic speech on May 25, 1961, that the United States "should commit itself to achieving the goal, before this decade is out, of landing a man on the moon and returning him safely to the Earth." The Mercury Project set the nation on a path that would lead to the Apollo 11's first manned moon landing on July 20, 1969. Two years later, Shepard became the fifth man to walk on the moon (and, famously, the only one to hit a golf ball from its surface) as commander of the Apollo 14 mission. You can follow Robert Pearlman @robertpearlman. Follow SPACE.com for the latest in space science and exploration news on Twitter@Spacedotcom and on Facebook.